Last month’s rare moment of low-rates and buyer’s market gets rarer still: rates dropped another 0.5% to the 4%-range, so homebuyers save while having their way with sellers, AND homeowners have a mini refi boom, AND 2019 recession predictions are mostly off the table (as described here and here). Giant improvement from October/November, when rates were closer to 5% and most economists were calling for imminent gloom. Let’s take a closer look at these 3 rare moments of housing bliss. Low inventory and years of home prices climbing back from the crash made most markets so tight that buyer bidding wars prevailed, but now way fewer homes sell over asking price and bidding wars have nearly vanished. But be mindful of whether February existing home sales jumping last week will make for a strong Spring homebuying season that brings back bidding wars. Like the refi opportunity noted below, buyer’s markets can indeed be rare moments. First, the Fed said last week they’ll keep helping rate markets by not raising overnight rates anytime soon, and by buying bonds that keep long-term rates like mortgages low. Second, some non-U.S. economies are shaky so the U.S. looks safest right now, and that causes more global investors to buy U.S. bonds that keep our rates low. Rates have tumbled in March as a result, but these moments require swift action, as noted below. Last year, the U.S. mortgage industry made $1.19 trillion in mortgage loans to homebuyers. Rates for the strongest profiles are now at or below 4%, and last year rates averaged 4.5%, with October and November being closer to 5%. Therefore, lots of recent homebuyers can lower their rate without refi fees eating up long-term savings right now. If a 30-year fixed refinance lowered your rate .5%, monthly interest savings would repay closing costs in 2 years, and the remaining 28 years are pure benefit from the lower rate. If you saved .25% with a refi, monthly interest savings would repay closing costs in 4 years, which still gives you decades of savings assuming you’re keeping your home long term. But talk to your lender immediately about this. 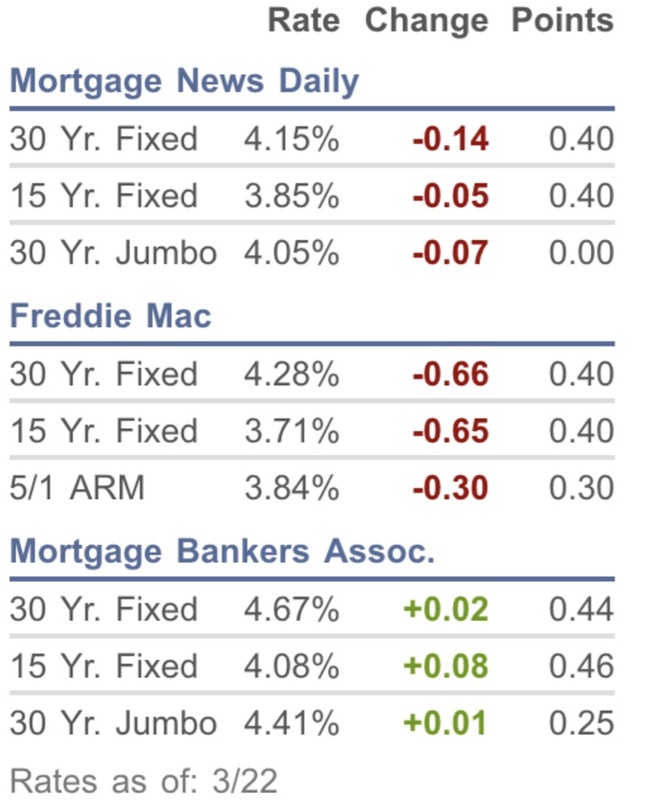 These rate dips don’t usually stick for long. As usual, go check out Matt Graham’s housing commentary below, which gets into more details about the outlook.